One of the real success stories in the commodities space over the past few years has been lithium. The reason for lithium’s stellar performance is primarily down to lithium-ion batteries that are being made and inserted into a host of digital devices (including electric cars, mobile phones and even your home) at a rate of knots. At the same time, the price of lithium is also be dependent on a range of other factors, and future prices are difficult to predict – so caution should be applied when looking at investments in the space. 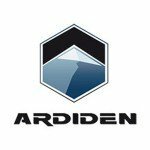 Ardiden (ASX:ADV)’s newest addition to its project portfolio is the Seymour Lake Lithium Project, which comprises five patented mining claims covering an area of 912 hectares. In this update article we will cover off the details of this project and also cover the recent strong graphite drilling results at its existing project. It’s clear that both projects have now captured the eyes of the wider market after last week’s news. In addition to lithium, another commodity that has been punching above its weight has been graphite and its space-age brother graphene. As with lithium, graphite demand has bucked the trend of most other commodities and raw materials. And again, it’s on the back of batteries that use bundles of graphite. Graphite is another space that ADV is working hard in, having just completed its 2000m drilling program , reporting high grade assay results as high as 12.65% Total Graphitic Content (TGC) and potential for super jumbo graphite flake size reaching as high as 4200 microns. The world is going digital and it needs a heap of batteries to do it! Mobile phones, laptops, electric cars – they all need batteries to operate. They’re all becoming must-have items and they’re all expected to see more sales over the coming decade. Which is where ADV comes into the picture. ADV hopes to produce high battery-grade lithium and graphite from one region, not too far away in a global sense from Tesla’s ambitious gigafactory that’s expected to produce 500,000 electric vehicles in the next few years. 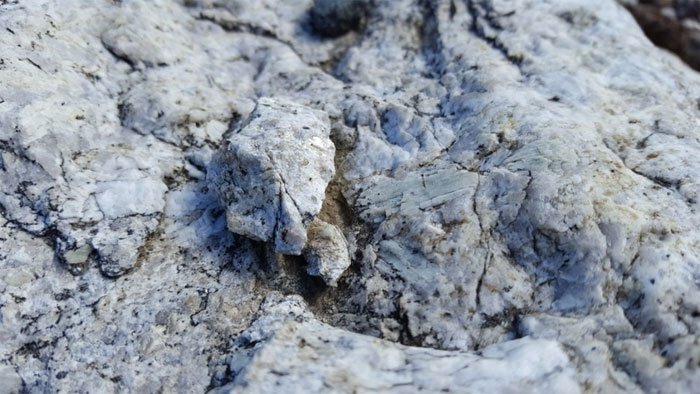 If ADV is able to develop both its graphite and lithium projects in Canada, the company could see a steady appreciation in value as it moves to production. Over 300 million shares were traded on 6 January alone (compared to an average of approximately 2 million daily average over the course of 2015) following its lithium announcement underlines just how market sensitive the news was. As stated, we first brought you ADV back in October last year in our article, ‘ Graphite Drilling in Weeks for Tiny ASX Explorer ’ where we laid out the case for this miniscule $10MN-capped explorer, hoping to get in amongst the hottest growth stories around right now – graphite and batteries. Towards the end of last year ADV was busy drilling for graphite at its Manitouwadge Project in Ontario, Canada. We alerted you about the pending graphite results in the article, ‘ North American Graphite Player ADV: Drill Results Imminent ’ where ADV’s drill results were eagerly awaited. Well, the drilling results are now in. ADV’s 2000m drilling program was a resounding success with high grade assay results, as high as 12.65% Total Graphitic Content (TGC), and super jumbo flake confirmed by independent analysis. One of the standout results is that ADV’s Manitouwadge project contains flake size as high as 4200 microns. Those of you that have been keeping tabs on the various ASX-listed graphite players we have covered here on The Next Small Cap , as well as our sister publication, The Next Mining Boom , will immediately notice that 4200 microns is unprecedented. Super jumbo flake is defined as anything above 500 microns. 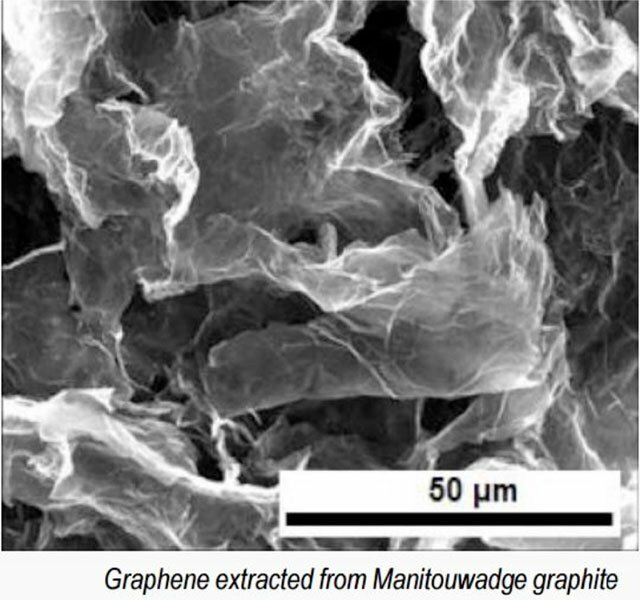 ADV’s initial explorations suggests Manitouwadge could be a humdinger of a project and considering the end-users of this graphite are likely to be battery manufacturers such as a Tesla; mammoth flake size is a great thing to have when looking for offtakes. ADV’s exploration is by no means finished and more work needs to be done...but already widths of up to 41.6m of graphitic gneiss were intersected during drilling which remains open along strike and at depth. ...but what ADV announced the day after its blistering graphite results could tip the balance of power into its favour. 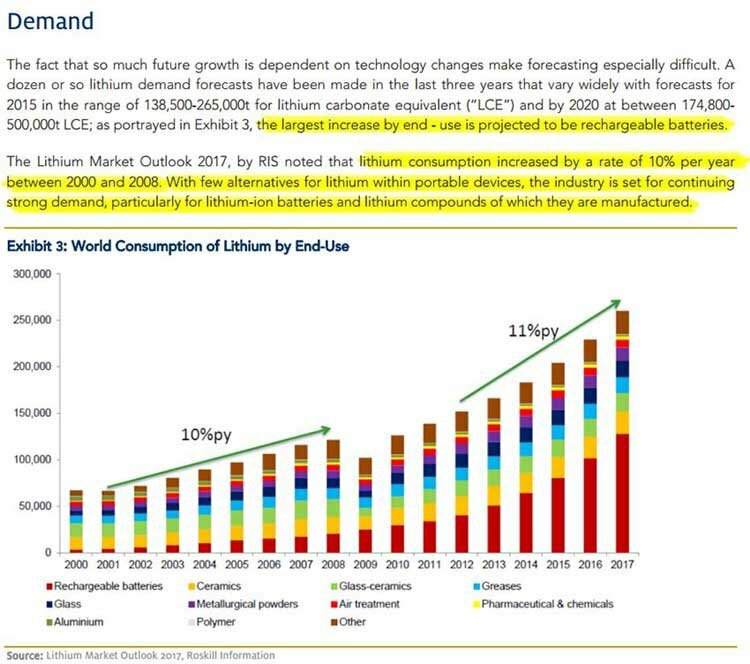 ADV is patiently getting its ducks in a row – for a duck shoot of epic proportions – as and when Tesla begins to vacuum up graphite and lithium supply in the coming years. 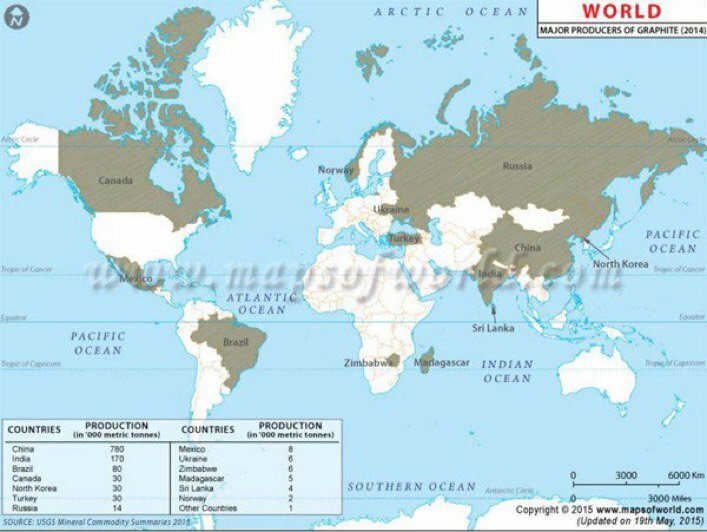 The company is on a mission to become a full-spectrum supplier to battery manufacturers by providing high grade graphite and lithium more or less from the same location: Canada. However, as a junior stock, we will have to wait and see if this mission is fulfilled – success is no guarantee here, and the company has many more hurdles to jump through before it starts generating revenue, so caution is advised before making an investment. With an advanced lithium project secured, (in addition to ongoing development of its neighboring graphite project) there is potential for ADV to elevate itself above its peers and put itself firmly toward the front of the queue in servicing eager battery manufacturers. But this is speculation on our part. ADV now has two prime exploration projects in Ontario, Canada. And one mission – to become a bulk supplier of raw materials to battery manufacturers such as Tesla and LG Chem. Have a look at the projected ramp-up of battery supply over the coming decade. 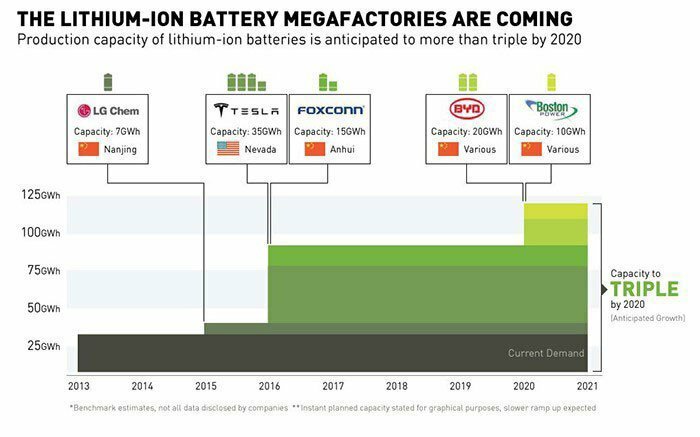 It’s quite astonishing that Tesla as the front-runner will soon be producing the same amount of batteries from one factory, as the rest of the world does combined. As you can see, the majority of these factories are earmarked for China, and that’s not something the US likes to see given the geo-political rivalry between these two competing superpowers. Plucky explorers like ADV could potentially tap into a frenzy as global graphite supply (around 2m tonnes per year) tries to catch up to insatiable demand for batteries that use graphite. In order to stand a chance at supplying these guys, ADV has positioned itself in the best possible place. 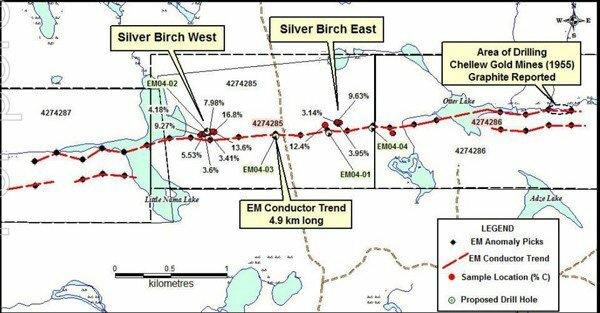 The Seymour Lake Project is earmarked to deliver ADV’s high grade lithium while the Manitouwadge Project penciled in to deliver high grade graphite. If all goes to plan, ADV will be able to supply both graphite and lithium alongside an expected supply shortage over the coming years. However, production is some time away – and it may not happen at all – so tread carefully if considering an investment in ADV, and take into account your own personal circumstances also. 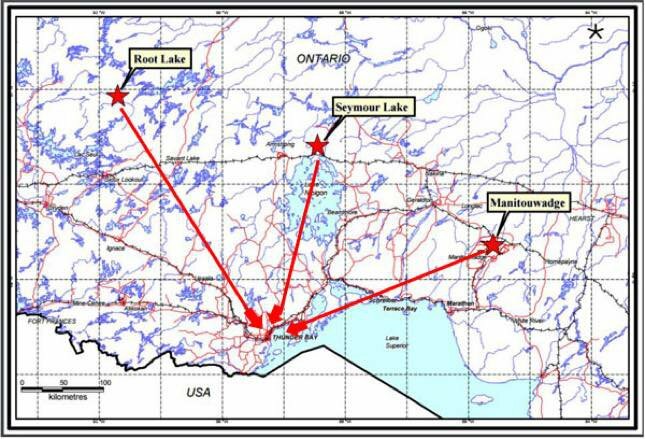 Seymour Lake has already seen 4000m of historical diamond drilling which confirms high grade lithium prospectivity. ADV withholds the right to accelerate or withdraw from the option at any time. The best aspect for ADV is that the acquisition is largely done via shares and includes the option to get out of the deal if ADV discovers something it doesn’t like as part of the 150-day due diligence period. Not only could ADV extract lithium here, but there’s also the prospect of unearthing tantalum and beryllium deposits which will contribute to by-product credits estimated to be worth US$500 per kg. Seymour Lake is less than 4 hours away by road from a key infrastructure hub at Thunder Bay which again plays into ADV’s hands given the close location to the US. And Tesla has been busy signing provisional offtake deals over the past year in preparation for the opening of its gigafactory sometime in 2017/2018. Not long after signing a supply deal with Bacanora Minerals and Rare Earth Minerals, just a few months ago, Tesla announced yet another deal, this time with Pure Energy Minerals. Clearly, battery makers are getting their act together and actively securing future raw materials to be able to manufacture their end-product. ADV is waiting in the wings and if we look at just how resilient the lithium market has been over the past decade, we can see that ADV is barking up the right tree. ADV owns 100% of the Manitouwadge Project, which is located roughly 100km away from Lake Superior in Ontario, Canada. 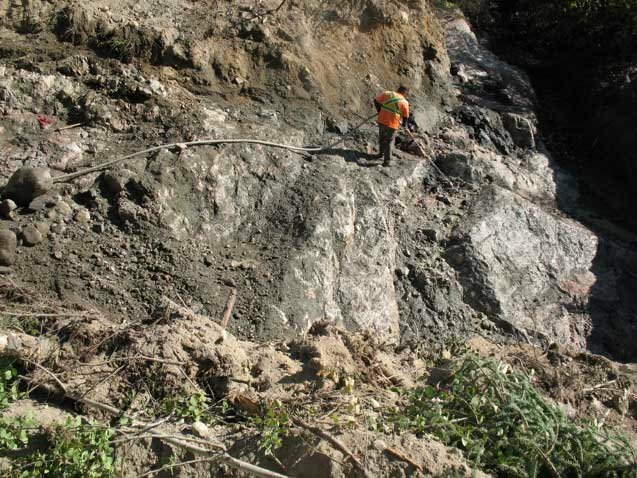 The Project site measures 3400 hectares and historic metallurgical tests on the ground indicate that 55% of the prospect’s graphite is either large or jumbo in size. Previous diamond drilling had firmed up the prospectivity of the project, and a review of geotechnical data suggests there’s a juicy electromagnetic anomaly on the project measuring a whopping 19.3km of strike length. That’s plenty for ADV to get its teeth stuck into – and it sure has so far. 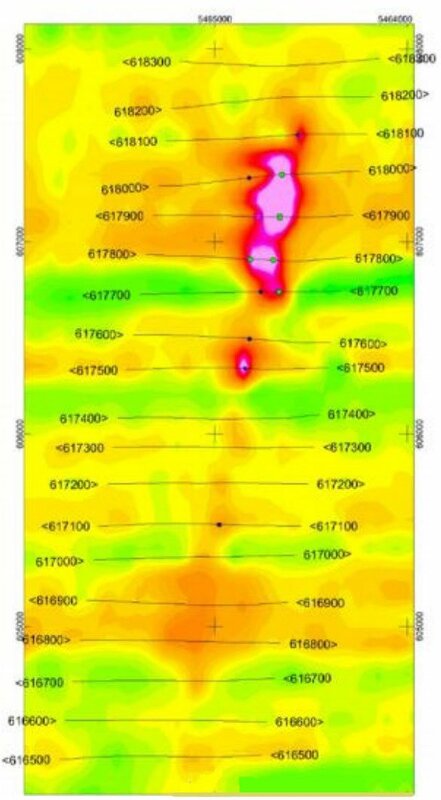 ADV’s initial results before assaying indicate 14 of 15 holes striking graphite mineralisation. The drill extensions and grades are summarised below. For a more visual look at what ADV has discovered, take a look at these laboratory comparisons that show flake sizes at 4209 and 3315 microns. In graphite, the larger the flake size, the better. Large flake sizes with high TGC content is what battery makers are looking for. ADV is ticking all the right boxes by getting its hands on high grade resources that are located close to market. If we look at who else is loitering with intent in Canada, it’s clear that ADV stacks up rather nicely on this front too. Confirming a JORC Resource has now become the company’s priority after seeing great drilling progress so far. With a maiden JORC Resource on its way later this year, that event could be a further price catalyst for ADV, which may see it catch up to some bigger Canadian peers. Hypothetically, if ADV was able to define a JORC Resource of somewhere around 20-70 million tonnes, that would immediately put the company on a level playing field with larger local players such as Zenyatta Ventures and Alabama Graphite. For now, the exploration done so far suggests ADV’s grade will be on par (if not better) than its local rivals which could see ADV’s valuation continue to move up as long as it can bag its maiden JORC Resource. ADV’s move into lithium exploration could really put the cat amongst the pigeons and set ADV far and above all its rivals. ADV has a hold of high grade lithium from its advanced Seymour Lake Lithium Project, announced on 6 January. As we indicated earlier, lithium prices have actually trended UP over the past 12 years. This is a rather different outcome to most other commodities that have suffered steep declines on the back of waning demand. Lithium has proven itself to be a metal with significant allure because of the rapid ramp up of digital electronic devices that require portable power. ADV is an early-stage explorer with a difference. The plucky upstart is threatening to spread its wings not only in graphite exploration, but also, lithium too. ...but then again, that’s what small-cap investors look for – bright companies that are undervalued and that have a potential big future. Having acquired sizeable acreage for exploration in two different resources, the next steps are to develop them appropriately with a JORC Resource the aim on the graphite side and further drilling as part of an evaluation period on its lithium project. All good things come to those who wait – and ADV has patiently waited out its opportunity to become a battery manufacturers’ dream offtake partner.